Everybody loves a good suspense story, and movies that depict weather catastrophes rank high up in the movie-goer ratings. The public eye likes to see people face, battle, and triumph against the natural phenomenon. However, the adrenaline rush we get when watching a film and the adrenaline spike that occurs in real life are vastly different. Tornadoes in the movies don’t touch us. Actual tornadoes are fantastic and fearsome events that deserve high respect and wonder. Why? Let’s explore the causes of these tremendous weather wonders. 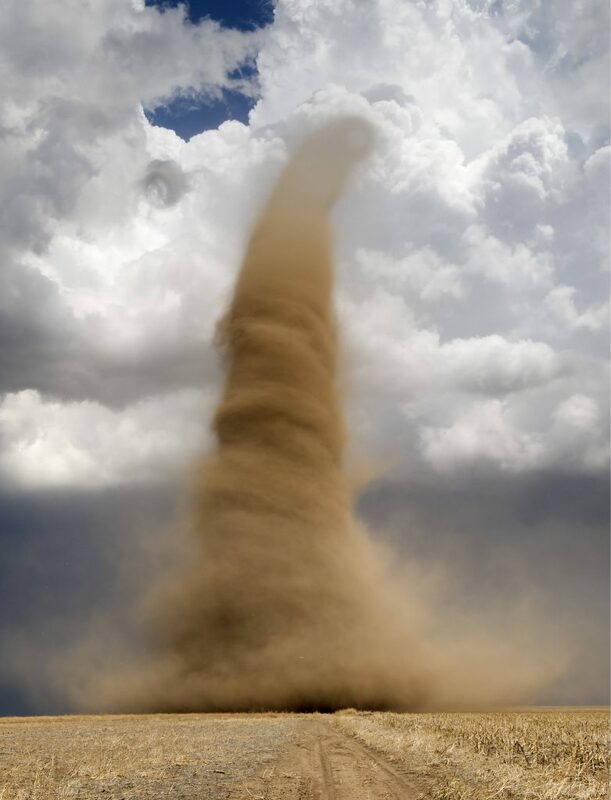 Tornadoes are rotating wind tunnels that are most visible when accompanied by moisture droplets, dust, and debris in the rotation. A tornado begins in the clouds – most often a cumulonimbus cloud, or more rarely, a cumulous cloud. If sufficient wind shear and instability in the atmosphere exist, the conditions are ripe for tornado formation. Of all the atmospheric types of storms, tornadoes are the most violent. According to the National Severe Storms Laboratory, the ultimate cause of tornadoes is unknown. What we do know is that the most deadly tornadoes form from rotating supercell storms. For a tornado to form, the “ingredients for regular thunderstorms must be in place. A regular thunderstorm occurs when there is warm, moist air near the surface of the ground and cooler, drier air above. The warm air rises forming an updraft. For a tornado to form, both the right wind shear and instability must be present together. Fast-moving winds “roll” air beneath them forming a horizontal spiral, or vortex. Wind shear refers to a combination of the wind speed changing the height and increasing and the wind direction changes. Instability typically means that the lower atmosphere is humid and warm while the upper atmosphere is unusually cool. So when the fast-moving horizontal vortex hits the updraft caused by the rising warm air, the vortex begins to change direction from horizontal to vertical. Thus, you have the classic twister. The combination of wind shear and instability leads up to tornadic activity, which precedes a cold front with low pressure. Weaker tornadoes can form when one or the other is stronger, but they must still both be present. A rain that quickly cools the atmosphere makes storm downdrafts stronger. These downdrafts play an essential role in tornado formation. A clearly defined radar circulation is called a mesocyclone. Meteorologists theorize that once one of the mesocyclones are well underway, the temperature differences around the downdraft of the storm may result in tornado development. However, this is just a theory. Some models have shown that the temperature variances matter little, as in the case of the Oklahoma tornado on May 3, 1999. Regardless, when the supercell winds rotate and blow in the upper atmosphere of the mesocyclone, and they combine with the updraft of the warm air and the cooler downdraft, often provided by rainfall, tornadoes are likely to form. Don’t take tornadoes lightly. Weather and circumstances may change in the blink of an eye, so be “weather smart!” Take precautions and take cover! You awake to the sound of rain slashing against the bedroom windows. Suddenly, the screaming wail of the tornado warning siren sounds in the night. Are you prepared? The actions that you take in the next few moments might save your life and the lives of your loved ones. The following tornado safety rules are essential survival tips to getting through a tornado. Survival experts recommend that you make a tornado plan for your family. Determine the safest spot in your home and have your family practice going to that location in a tornado drill. Put together a supply kit that includes a flashlight, battery-powered radio, first aid supplies, and bottled water. Tornadoes form in supercell thunderstorms. These powerful storms have fierce wind, hail, and rain. The difference between a supercell thunderstorm and other storms is that the supercell has a strong updraft which causes the storm to rotate. Sometimes, for reasons that remain unclear to scientists, the supercell thunderstorm form tornadoes. Tornadoes are most likely to form during the spring and summer months as warm and cold air collides. So, the first tornado safety rule is to keep an eye on the weather. Watching the weather is especially crucial if there are thunderstorms in your area. If the weather service issues a tornado watch it means that conditions are favorable for the formation of a twister. In general, this says that there are violent supercell thunderstorms in the area. Pay attention to the weather and all official weather information. A tornado warning means that a tornado is on the ground. If the tornado warning siren is engaged, you must take immediate action. As soon as you hear the siren, you must move to the lowest part of the building. If you have a basement, go to the basement. If not, go to the lowest level of the building and take cover in an interior room without windows. The goal is to put as many walls as possible between you and the tornado. Do not leave your house if a tornado siren is blaring in your neighborhood. At this point, any structure is safer than being outdoors or in a car. Countless numbers of school children practice tornado drills each year. One of the most valuable things that the children learn is to duck and cover during the tornado. In the event of a twister striking your home, there will be a massive amount of debris flying in the air. Suddenly, household objects become potential killers. Your survival depends on your ability to protect your head from debris impact. Get underneath a substantial piece of furniture if possible. If not, crouch low to the ground and put your arms on top of your head. Tornados are frightening experiences. Each year, they form and carry out their destructive paths throughout the United States. You can’t keep one from striking your home, but, you can prepare to increase your chances of survival. Certified shelters are tested multiple times and are proven to stay intact even after a direct hit from a storm or tornado. If you are going to buy a shelter, always make sure that FEMA (the federal Emergency Management Agency) has approved its usage, as these are much more reliable, cost effective, and have the proper structural integrity. These guys build tornado shelters that are rated to withstand an EF5 tornado. You want to look for shelters that meet that requirement for sure! Do You Need an Above or Below Ground Shelter? Both types of shelters, if built properly, are effective at protecting you from a tornado. However, deciding which one is better for you depends on your situation. An above shelter is normally easier for handicapped or elderly people to come in and out of, while underground shelters may be better for individuals who are easily able to move. Regardless, both are equally suited for any storm. Make sure there are multiple ways to get in and out of the shelter in case there could be debris that blocks passage through one of the entrances. Also, make sure that all doors are sturdy and properly latched. It may be just a small part of your entire shelter, but the door insures that your structure is safe and storm proof. If disaster does strike and you are forced to reside in the shelter for an extended period of time, make sure there is enough ventilation without compromising the structural integrity of the structure. Since you may not know how long you would need to stay inside your shelter, it is best to have ventilation that makes it easy to take in oxygen. Both indoor shelters and outdoor shelters are efficient at protecting you. However, an indoor shelter may be better in terms of saving time for you and your family to get to safety in situations of quick emergencies. Outdoor shelters, however, are better in terms of saving space inside your home, and giving better access for your neighbors to use if you do decide to share the same shelter. There are many different things that go into deciding which shelter is perfect for you. However, it all depends on your situation and your needs, but always make sure the shelter is manufactured from a respectable company and is FEMA certified. Buying a home can be an exciting part of your life, and that home may very well be the place you will live in for the rest of your life. That is why it’s important to select the right home for you after establishing your budget and doing the appropriate amount of research in making sure your new home is ready for you to move into. Always make sure that damages are not present, and if they are that they are fixed by the current homeowners. Therefore, the following are things to look for when buying a home. Water Heaters: ensure that the heater is cleared of any accumulating minerals and that there are no cracks. Damaged water heaters will leave your entire home without hot water until fixed. Sump pump: sump pumps ensure that your basement does not get flooded. Ensure that they are working properly and that any debris is cleared. Water pressure: ensure there is proper water pressure in all the fixtures throughout the home. Lower water pressure can be a sign of a leak or broken pipe. Insulation: during the winter, pipes can freeze and burst. Ensure that there is insulation (if not, make sure it will be relatively inexpensive to have it installed in your home. Mold occurs due to dampness and can be extremely expensive to clean up. Ensure that your potential home has no mold or water damage. It is good to ensure your house is in the best condition possible. Just as important, however, is the location and neighborhood. Is it in driving distance to your work or school, or would you need to take a train? Are there parks nearby? Is the house located in a rural or urban environment? You should consider these questions before buying any home. What Amenities are Included and in What Condition? Is there a dishwasher and is it in new condition? What about the fridge? When buying a home, make sure it has the amenities you need and that they are in the proper condition to avoid paying too much money in having them replaced. Making sure that your home is in a high quality condition before you buy helps relieve the stress of having to spend extra money in getting things fixed or replaced. Take into consideration the type of neighborhood it is in and whether things such as grocery stores or malls are within a proper distance. A reliable vehicle is essential in today’s modern society as it makes getting to work, school, or pretty much anywhere much more convenient. When buying a vehicle, however, it is important to note a few key options and selecting one that is most suited for you and your lifestyle. One of the major things people think about before even determining what to look for in their vehicle, is their budget and whether they wish to buy a newer or older car. The first thing car buyers think about is whether to save some money by buying a used car, or perhaps shelling out a bit more cash for a newer model. Older cars tend to have accumulated more miles and may need more frequent tune ups or inspections. Also, depending on how old the model is, it may not come with convenient features such as electric powered doors or windows. However, used cars do not always mean old cars, and in fact, with a bit of researching, you can find a perfectly viable and healthy car that is a more recent model. The benefit of buying a new car is being sure that it operates at maximum efficiency as soon as you buy it and that it has a long lifespan. Always check on the vehicle history report when buying an older model to see if there are any serious problems that seem to be recurring. Depending on how often and how far you tend to drive, select a car that is fuel-efficient. Cars that are extremely fuel-efficient tend to require less fill ups, therefore saving you both time and money. Smaller cars for the most part will always be more fuel efficient than larger cars or SUVs. Buying an electric car or vehicle is also a possible option as these are safer for the environment. However, not every area has a charging station and you may need to drive several miles before finding a way to recharge your vehicle. Electric cars also tend to be more expensive and slower, but overall they are still reliable and cost effective in the long term. Different dealerships will have different financing options, making it more possible to pay off cars over a few years in easy to manage chunks. You can get better interest rates if you allow the dealership to run a credit score test; the better your credit, the more qualified you are for better interest rates. Also, there are added sales tax, documentation fees, and registry fees that are compounded on the actual cost of the car, so always make sure what your final price is. This can be done quickly by simply asking the sales manager a breakdown of the costs for a specific car.